When we do major upgrades, the recompilation of all objects is required. In some cases the number of objects could be enormous, In such scenario we use utlrp script which allows the recompilation in parallel. The script uses UTL_RECOMP package with parameter 0, if no number of threads specified. What is the number of parallel threads script will actually use? However, by default the job_queue_processes is 1000! So this cannot be true. before utlrp script execution to make sure that we do not create artificial contention. So what is ‘memlock’ and where this requirements are coming from? 1. Lets configure Hugepages and set memlock much lower then Hugepages configured and see whats going to happen. What we see now that only 5 of Hugepages are used and system is experiencing heavy trashing. The instance has never opened and I aborted it after 1 h of wait. 2. Also starting from 11.2.0.3 oracle should use all available Hugepages even if number of hugepaes configured are less then shole SGA. It looks like it is required that all configured hugepages should be able to be locked into memory. 3. Therefore, the proper memlock configuration is very important and should be correlated to the number of hugepages and not to the total amount of physical memory. Recently I hit the following issue. Im installing Vbox on new machine and in order to configure the connectivity between host and guest os, we need to setup the host-only network and the adapter on the guest-os side. However, after the vbox machine start I noticed the following error message. Failed to open/create the internal network ‘HostInterfaceNetworking-VirtualBox Host-Only Ethernet Adapter #2’ (VERR_INTNET_FLT_IF_NOT_FOUND). I was pretty sure that all config was right as I did it on other machine. Please make sure that “VirtualBox NDIS6 Bridged driver is set’. 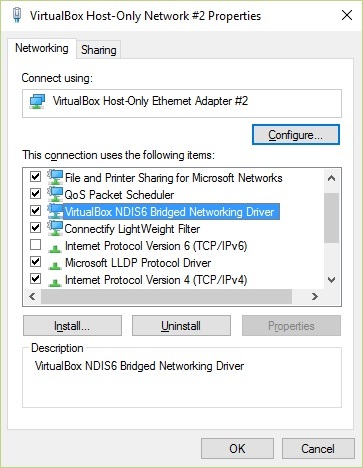 Disable/Enable the virtual network adapter in order to make the changes effective. For many years Oracle Clusterware have suffered from lack of native support of cluster interconnect redundancy. In the same time we still could configure more than one network for RAC cache fusion. To prevent interconnects being single point of failure, we could use 3rd party clustering solutions for older versions of oracle, or just use solutions provided by OS like network cards teaming, this often brought additional cost and complexity to the solution. Starting from Oracle Grid Infrastructure 11.2.0.2 few feature called HAIP (High Availability Interconnect) been introduced, allowing us to configure up to 4 private networks for interconnect use. New crs resource ‘ora.cluster_interconnect.haip’ have appeared crs ‘kitchenware’ which uses multicast protocol for initial bootstrap and rac cache fusion. This puts additional requirement to the network because often the protocol is turned off at switch level. As an another requirement, each private network must sit in its own subnet, otherwise unplugging the cable will cause node eviction. We can configure up to 4 networks for interconnect, if we set more than one private network, lets say 2, oracle will assign and use 4 addresses anyway attached to 2 physical network interfaces. In following example I’ve created 3 interconnects initially, and then removed first (eth1) and third (eth3), leaving only eth2. Here we see all 4 addresses attached to the single net interface. In terms of RAC interconnect configuration, we will see all 4 addresses configured at database level. |The HAIP feature allow us to change IP of interconnect on the fly without impacting the service, as it was in previous versions (we needed to stop crs on both nodes to change interconnects). I’ve created small test case which generates lots of messages and block flying over interconnect. This was done by creating small table and updating same blocks, even rows from 1st instance and odd rows from 2nd instance. The test generated several hundred messages and blocks per second travelling over the interconnect network, with load of about 4MB/sec. While the load was present, I removed 2 networks, leaving only one, then I added 2nd network and dropped first one. The interfaces wasn’t dropped immediately, few minutes passed until the relocation has occurred. According to ‘gc blocks lost ‘/’gc current lost’ and other stats, no blocks dropped during the operation. Ive experienced problem with installing em gridcontrol oms 10.2.0.4 64bit on redhat linux 5 64bit. Configuration assistant was unable to start web server with error finding libdb.so.2 library. We have attemted to install different libs with no success. After few hours of experiments we have decided to use rhel4. It seems that rhel 5 is not supported yet.